Holy Sepulchre - What Do You Know About The Holy Sepulchre? The Holy Sepulchre, called “Al-Qiyame” in Arabic (meaning the Resurrection), is no doubt the most important shrine in the Christian world. It is believed that on its grounds Jesus Christ was crucified, buried and rose from the dead. The church was built by Emperor Constantine and his mother, Helena, in 326 AD and it was dedicated nine years later. When the Caliph Omar took the city in 638 AD, he was invited to pray in the church but he refused, noting that if he did his fellow Muslims would have turned it into a mosque. In 1009, however, the church was destroyed by the mad Caliph Hakim. 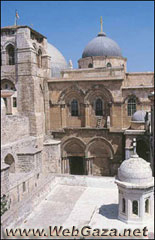 Unable to afford the necessary major repairs, Jerusalem’s Christian community had to wait until 1042, when the Byzantine Imperial Treasury provided a subsidy. This was not enough to pay for a complete reconstruction of the original church, so a large part of the building was abandoned, but an upper gallery was introduced into the rotunda and an apse was added to its eastern side. This was the building that the Crusaders entered in 1099 as the new rulers of Jerusalem. They made significant alterations and re-consecrated the building in 1149, on the 50th anniversary of their capture of the city. The structure of the present church remains to a large extent a Crusader construction, although major repairs and additions were rendered necessary after a fire swept through the building in 1808.